Yesterday marked the announcement of the line up for Scotland’s newest music festival. 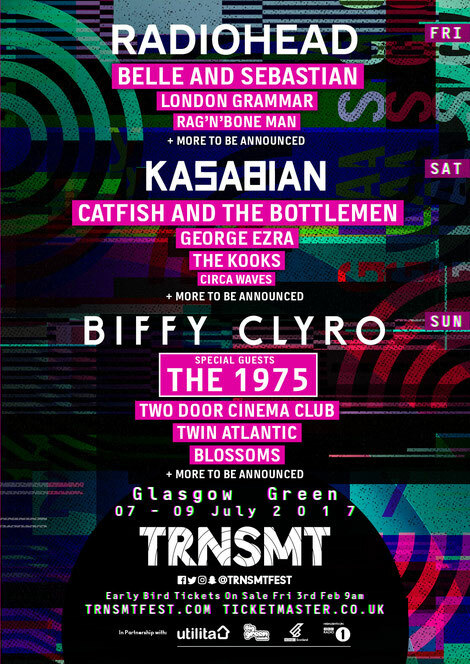 Taking place at Glasgow Green from 7-9 July, 2017, TRNSMT will feature headline performances from Radiohead, Kasabian and Biffy Clyro. The 1975, Catfish and the Bottlemen, Belle & Sebastian, London Grammar, George Ezra, Two Door Cinema Club, Twin Atlantic, The Kooks, Blossoms, Rag‘n’Bone Man, Circa Waves and many more to be announced, form the line-up this summer. Glasgow Green will play host to this non-camping festival, which aims to stage global superstars alongside the very best of local talent. Glasgow, the UNESCO City of Music and cultural and artistic hub, will provide the backdrop as TRNSMT interrupts Glasgow’s summer air with a celebration of music, aiming to bring people together to enjoy the acts they already love, discover the new, and possibly undergo life-affirming experiences. TRNSMT will offer entertainment over two stages and this in attendance will enjoy music, arts, culture, bars and restaurants as they customise their individual festival experience across the three days. Check www.TRNSMTFEST.com for more info.